Click on the image to view the full PDF. File is 6MB in size, and may take a moment to load. Once an infestation has been confirmed, rapid response is crucial. The prospects for effective management or even eradication, is greatly increased by swift, well-planned, and properly executed controls. 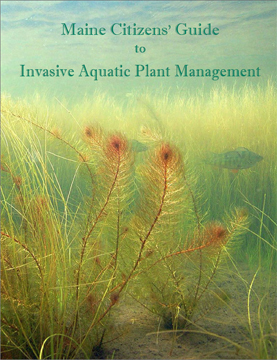 The purpose of the Citizens’ Guide to Invasive Aquatic Plant Management is to provide the information necessary to effectively manage invasive aquatic plant (IAP) populations; to prepare for such an eventuality; and to address all associated activities. Methods described in this Guide are based upon tested best management practices for controlling aquatic plants effectively and in a manner that protects wildlife and habitat.